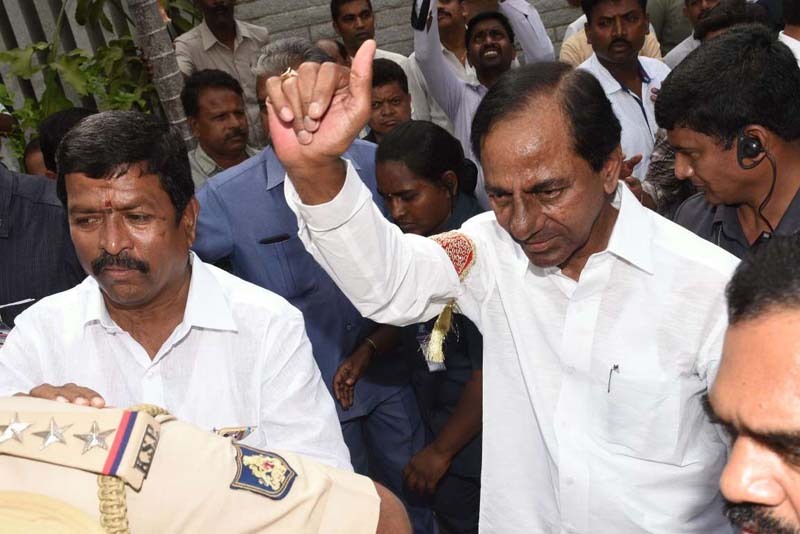 The K Chandrashekhar Rao (KCR)-led Telangana Rashtra Samithi (TRS) is likely to storm back to power with an impressive margin in Telangana once the results of the assembly elections are declared on December 11. India Today-Axis My India exit poll predicts that KCR is likely to win 79 to 91 seats in the 119-member house. India Today-Axis My India exit poll predicts that the alliance between the Congress and Andhra Pradesh Chief Minister Chandrababu Naidu's Telegu Desam Party (TDP) is expected to win just 21 to 33 seats in the Telangana assembly election, voting for which was held today (December 7). The exit poll projects that the Bharatiya Janata Party (BJP) will garner just one to three seats, while the Assauddin Owaisi-led AIMIM will win anything between four and seven seats. The battle for Telangana is interesting because this is the second assembly election that the state is facing after it was carved out of Andhra Pradesh in 2013. The first one was held in 2014. Chief Minister K Chandrashekhar Rao faced a challenge from the TDP-Congress alliance. When it comes to the vote share of each party, the exit polls says KCR's TRS will get 46 per cent of the votes polled in the state. The Congress-TDP alliance is projected to get 37 per cent of the votes. The BJP and AIMIM are expected to garner around 7 per cent and 3 per cent vote share respectively, while others will get 7 per cent vote share.